"Capt. GidddyUp awarded Merit of Honor and Elaine Mclaughlin E-Award by Lee County"
Bonita Living Magazine (March 2007) considers Capt GiddyUp as One of the Top Saltwater Professional Guides in Florida. Click for story. Lee County declares 12-4-2007 to 12-11-2007 as "Official Week dedicated to Captain GiddyUp"
Capt GiddyUp invited to meet President of the United States but makes difficult choice"
Captain Bunch is a professional fishing guide with a passion for fishing. Born and raised on a small barrier island off the coast of Charleston, South Carolina, he grew up with fishing as a major part of his life. His favorite song "I'm gonna miss her (The Fishing Song)" by Brad Paisley sums up his devotion to the sport. 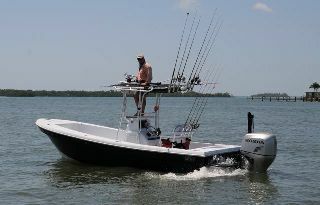 Captain Bunch is perhaps one of the best known and respected Professional Saltwater Guides in Florida. As the vastly popular media personality "Capt. GiddyUp" he was an instant sensation on SW FL Outdoors and became a viewer favorite. Bob Stewart, Executive Producer of SW FL Outdoors, composed the following introduction for TV audience on his website. They quote. "Even though Capt. GiddyUp is the only non-native on our staff, his well-spoken manner on camera and his intense desire to produce fish has him at the forefront of many of our shows. Capt. GiddyUp is always looking for that little 'trade-secret' to pass on to our viewers." A once in a lifetime opportunity soon surfaced to join the cast of the vastly popular TV Fishing Show "Light Tackle Angler" with Capt. John Follweiler. After the filming of their first TV show together Capt John Foeweiller offered this observation of Capt GiddyUp. "It took me less than 20 minutes to realize I had found the perfect fishing partner for filming a great TV Fishing Show. On the day we chose to film it was so windy that I didn't think we had a prayer of completing a show. GiddyUp simply said, "Let's go to one of my favorite docks. We will be sheltered from the wind and we will catch fish." In less than 4 Hours we filmed one of my favorite and best episodes of "Light Tackle Angler." Capt GiddyUp put us on some trophy fish but his on camera manner made us relax, laugh, and feel as though we had known him for all our lives. Personally, I find him to be a remarkable fisherman but more remarkable as a human being. His contributions to US Troops on their combat leave actually inspired me to do more for my Country. Very few men have ever inspired me like Capt GiddyUp. Operation Open Arms is a miracle to US Troops and their families. Capt GiddyUp is the founder. Not a lot more needs to be said except this. I am proud of the close friendship we now share." 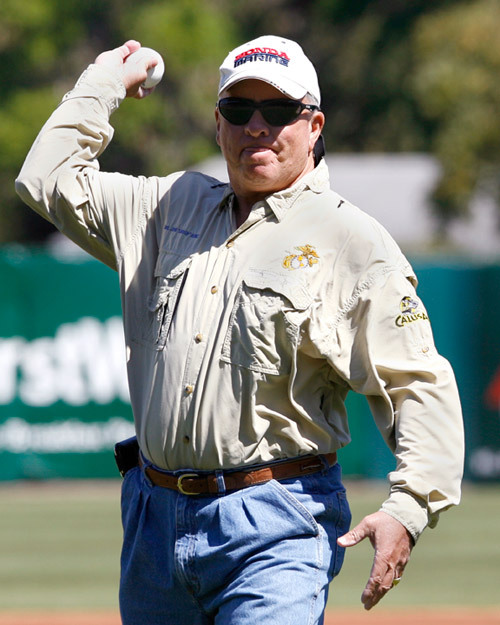 It was not long before the The Today Show (NBC) sought to feature Capt GiddyUp for his legendary status within the Florida fishing community and to recognize his contribution to US Troops as Founder of Operation Open Arms (www.operationopenarms.com). In May 2006, he was the subject of a Wall Street Journal article. In March 2007, Bonita Living Magazine recognized Capt.GiddyUp as one of the premiere fishing guides in the State of Florida. On December 4th 2007, The Lee County Commissioners declared the week of 12/4 to 12/10 "Captain John "GiddyUp" Bunch and Operation Open Arms week." "... He has developed “nearshore” trolling with big lipped lures to a science, catching grouper in six feet of water around mangroves and big breeding snook over reefs several miles offshore. " Captain GiddyUp also appears as a contributing editor for the "Waves" section of the News- Press reaching a circulation of 525,000. His feature "Nautically Speaking" appears in the Naples Daily News Boating & Fishing Section, The Bonita Springs Banner, and the Marco Island Gazette. He is genuinely regarded as one of the top outdoor writers in Florida and perhaps the funniest. Scott Clair of the Naples News had this to say - "As a contributing writer to Nautically Speaking, Capt. John "GiddyUp" Bunch has proven to be just as deft with a punch line as he is with a fishing line. One of the top professional fishing guides in Florida, Capt. GiddyUp's articles mix expertise with humor, always providing the reader with a wondrous adventure. Read Capt. GiddyUp's monthly article in Nautically Speaking, you're guaranteed to learn...and laugh!" Capt GiddyUp is the recipient of my prestigious awards. Please visit his tribute to those who serve in the US Armed Forces at www.operationopenarms.com. He is the fishing guide of choice for US Senators, Heads of State, Movie Stars, Sports Stars, and for all regular people just like the Captain. Says the Captain, "Everyone has fun when they fish with me. All of God's children are treated the same. I treat others as I wish for them to treat me." Captain Bunch firmly believes the hours spent on the water fishing should be enjoyable and free of a grouchy ole salty Capt. "If you're going to spend the day with someone fishing, I strongly recommend they be fun, courteous and understanding." Requires a Java Enabled Browser. Read what my clients have to say!! * A 4 hour GiddyUp charter requires 5 hours. The Captain starts the clock when the lines get wet not at pick-up.